Having convinced the government and the judiciary that there is NO MONEY FOR LIBRARIES, and that cuts will now be made in essential services, Brent has found £420,000 extra to give to Ward Working, a fund that local councillors spend on grafitti workshops, noticeboards and flowerbeds. It costs under £400,000 to keep open all 6 libraries closed last year. Less if efficiencies were made. At tonight’s budget meeting, Leader Ann John announced the same amount would now be available Ward Working, raising it’s budget from £800,000+ to more than £1.2 million each year. Despite thousands of complaints, the DCMS has said it will not investigate the library closures in Brent. They met Brent Council in June, but have refused to speak to us, or hear our (ample) evidence. Now, after a letter from our legal team challenging their year-long silence on the matter, they have finally spoken. Do you think the consultation was adequate? Did they take into account the needs of library users? What has been the effect of closure on your family? Pay parking is killing Preston Road, an area that already has no library, no health services, no council services, no sport centre, no adult education services. This could be the future of the borough’s shopping parades as businesses struggle to survive against increased parking charges and over-zealous ticketing. Over the past two years Brent Council has been accused of bringing misery to traders and drivers by introducing pay and display across all shopping areas. It has also increased residential parking permits by up to 300 per cent in some cases in Controlled Parking Zones (CPZ) depending on the size of the car’s engine. But now the Times can reveal that the income from parking fees will be £1.3million less than expected as drivers avoid the highger charges. However, at the same time the local authority is expected to make an extra £2million than it first budgeted for from parking fines. Like last year, not-quite-World Book Day events won’t be coming to Preston. And we’re not even sure it’s coming to Wembley full stop. The loss-making Brent Magazine this month proclaims Ealing Road Library to be the top venue for the events on March 1. Yet on the previous page we have just been told it will be closed for improvements between 27 Feb and 26 March. So will Ealing Road be open or closed on March 1? Should you traipse across town to another closed library? Brent has a habit of closing libraries on a whim. 1. Brent Magazine runs at a loss of £1000+ every month. Further, the advertising that supposedly pays for it, comes from Brent COuncil departments. And many people don’t even receive it. 2. Ealing Road may be being improved, but its not being extended, nor parking added. So it is just as overcrowded and inaccessible as ever. Burns Night in the land Brent forgot! With thanks to the fair Geraldine. Comments Off on Burns Night in the land Brent forgot! The Great Scot, Robert Burns will be with us in spirit on Saturday 11 February. Although our legal challenge through the courts has come to an end, it is not over. We are now going to challenge the Culture Secretary, Jeremy Hunt on his department’s failure to investigate library closures for more than a year. We will do this on two fronts. Today, our legal team has sent a letter demanding action. The DCMS met with Brent Council last year, but has so far ignored thousands of complaints made by us. Over 130 submissions were made by all sorts of groups and people. It makes for very interesting reading. You can find our 3 submissions at pgs 133, 366 and 544 as well as one from Barry Gardiner MP (pg. 583) and the inevitable defence from Brent Council (pg. 608). You can read them all here. A packed out Windermere nestled in the snow was the perfect setting for us to celebrate Charles Dicken’s 200th anniversary. Following the children’s storytelling day at Preston Park school, it rounded off a hugely successful National Libraries Day, despite yesterday’s bad news. Readings from the man of letters and Whitbread Prize-winner Paul Bailey and music from the inimicable CLOS made it an night to remember. Let’s not forget the children – and yet more distinguished authors, like Leon Rosselson, Kaye Umansky (below), Daniel Kitts, Dyan Sheldon and Jenny Newland. Brent has no plans to ever hold an event locally here. That ended when they closed our only portal to the council, and lied to us that they would make it up via “outreach”. Dan Jarvis is the shadow arts minister, he is Labour leader Ed Miliband’s libraries’ man. This week, he told the Guardian how important libraries are, and how he plans to save them. The benefit of libraries to communities is harder to measure, but I’ve seen it with my own eyes, in libraries large and small, from Barnsley to Bermondsey. Does this government see it? Libraries minister Ed Vaizey‘s stock line has been: “I don’t run library services. Local authorities do.” He has a point: libraries are run by democratically elected local governments, and they take the lead. But that’s no excuse for doing nothing. It may not be Vaizey’s job to micro-manage every library in the country – but it is his job to be their champion. And that is what he is failing to do. Blaming the government for allowing them to close, he is silent on the fact that in Brent, it is his own party that has been fighting for the right to close libraries. As we wait for Jeremy Hunt to get up off his behind and do his job, is their any politician who is willing to walk the walk?? Comments Off on Your Library Needs You! 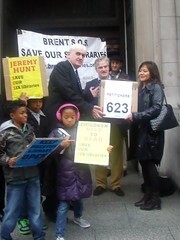 Campaigners leading the fight to save Brent’s closed libraries are not giving up hope and have vowed to carry on. The news library supporters had been dreading was announced today – that the highest court in the land, the Supreme Court, will not hear their case.